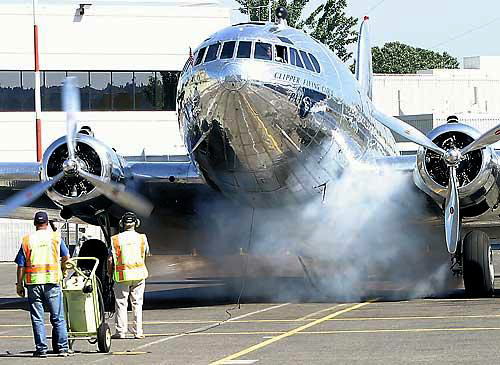 Exhaust billows yesterday from a restored Boeing 307 Stratoliner warming up for its Seattle departure. Volunteers restored the plane for a second time after a crash landing in Elliott Bay last year. The last Boeing 307 Stratoliner took off from Seattle under a clear blue sky yesterday morning, heading to its final resting place at the Smithsonian National Air and Space Museum. And this time, the pilots made sure it had enough gas. Volunteers had spent six years restoring the silver 1940 aircraft in preparation for its museum-bound journey. But during a March 2002 test flight, its four engines ran out of fuel and it splashed down in Elliott Bay just 50 feet from a busy West Seattle restaurant. Thats kind of a bad day in history for me, said Buzz Nelson, the senior captain aboard the flight. The two Boeing test pilots and two mechanics on board were rescued unhurt. The National Transportation Safety Board later found the crew had failed to check how much fuel was in the tanks. Im really grateful to have a chance to fly it again, Nelson said. The Stratoliner was the first commercial transport plane with a pressurized cabin, and thus the first able to cruise at 20,000 feet. Pan Am dubbed this one the Clipper Flying Cloud and used it on a Caribbean route. One-way tickets in those days cost $1,000  about $12,000 in todays dollars. Flights included service by hostesses with stylish caps and white gloves. During World War II the plane entered service with the Army Air Transport Command. In 1954, after returning to commercial service, it was sold to the Haitian Air Force, and eventually it became the personal airplane of François Papa Doc Duvalier, the nations dictator. It changed hands a few more times and in 1972 was acquired by the Smithsonian from a private owner who had planned to use it as a crop duster. The museum loaned it to the Pima Air & Space Museum in Tucson, Ariz., which is where Boeing workers found it and decided to restore it. They did some basic work to make it airworthy and in 1994 flew it back to Seattle. It was in sad shape, said Gary Dawson, a retired Boeing manager whos been involved in the restoration since 1998. The insides were gutted and the cabins insulation was torn, with old paint and corrosion everywhere. Ive always had a love of history and these old aircraft, Dawson said. The inside has been restored to its original finery, with a row of nine single seats on the port side. On the starboard side are four sections, each containing two rows of three seats that face each other, with a curtain for privacy. Career aviator Pete Williams, 79, was on hand for the takeoff yesterday. He flew the craft for six months, beginning Dec. 30, 1949, according to an original log book that his wife, Peggy, had. He recalls the plane as being very comfortable. The Stratoliner is to arrive Tuesday of next week at the Steven F. Udvar-Hazy Center, the Smithsonians new companion museum at Washington Dulles International Airport in northern Virginia, Nelson said. First the plane will visit a Wisconsin air show and make other stops before its permanently grounded.